Up until now, my primary focus has been Huey’s outstanding intelligence. I’ve focused on how Huey’s intelligence is perceived by a larger audience as well as how it is perceived by other characters in the series. 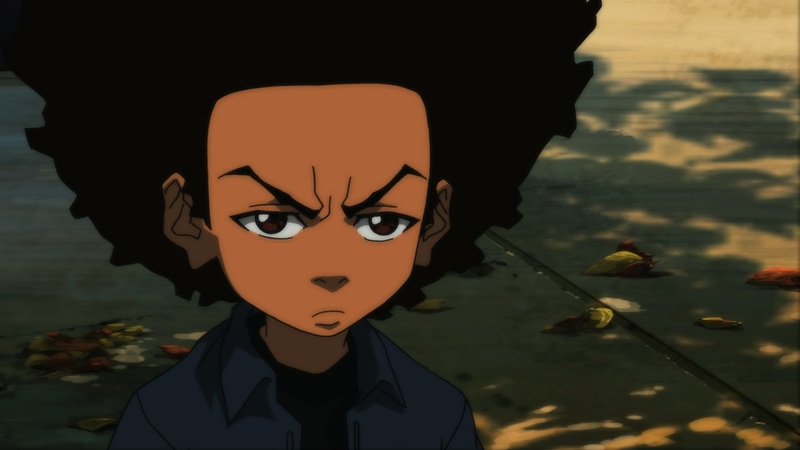 But what were McGruder's aims in giving Huey such a high level of intellect? Huey’s knowledge is very specific to his immersion in black cultural and historical knowledge. McGruder has equipped him with an intelligence that even surpasses that of some adults. Unfortunately for Huey, not too many people in his environment can comprehend his level of intellect. This many times makes his intelligence work against him rather than for him. No matter how smart Huey is, he still cannot change things at a societal level, because he is just one person, alone against many odds. An individual can initiate change as well as progress it, but in the end, one needs assistance. McGruder portrays Huey with a lack of this assistance, and so many times Huey’s ideas don’t go as planned. Huey alone cannot change things for the better, but if his surroundings were unified and all working toward one cause, they would be a much more powerful force. Of course, McGruder is interested in emphasizing how problematic many environments and much of society is. Huey is only 10, but if the people in his society were to move forward on some of his ideas, they’d see major change.